Conan on the Jpop Music forums is reporting that Flash magazine will be reporting information on the divorce of Ishiguro Aya. Please note that this is only gossip. The headline uses the kanji 完全別居 which translates as complete seperation (divorce). Ex-Morning Musume and Hello! 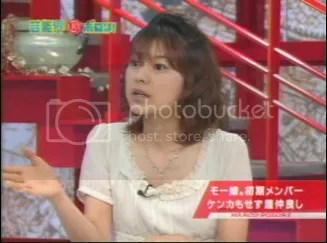 Project member Ishiguro Aya (now Yamada Aya) appeared on talk show Marco Polo yesterday and she reveals some very interesting insights into life as a Morning Musume member, a brief chat on Tsuji Nozomi (whom she never actually worked with). She’s looking good and she has a really great laugh, I came to know about Hello! Project way after Aya left the group so it’s kind of nice to see her on TV. You can download the episode from Hello! Online. Get it while it’s hot!